But that was before the wild roses burst into bloom. 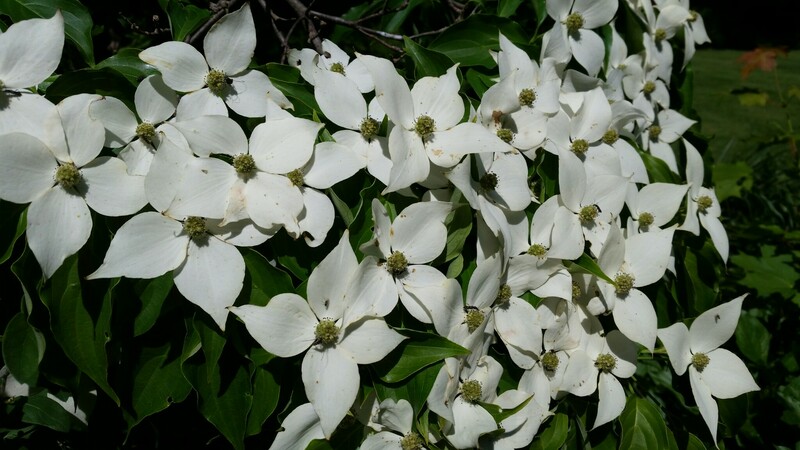 Drive into the country in early June and you’ll find the roadside bushes exploding with clusters of white flowers. A sweet fragrance wafts along the breeze. In upstate New York, this is the smell of early summer. 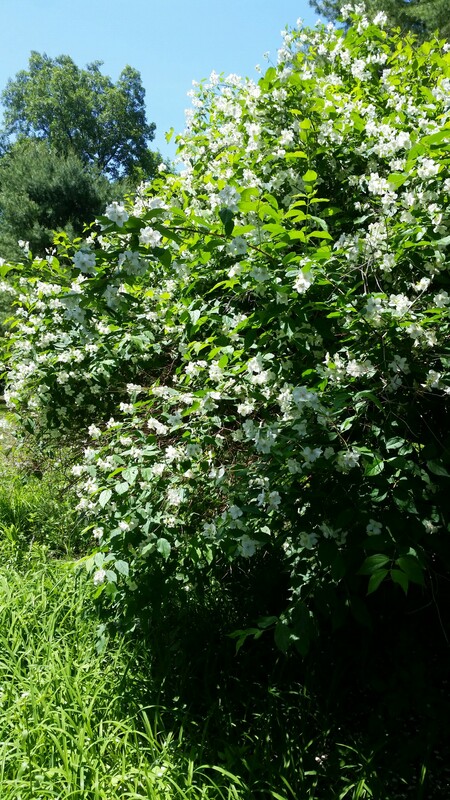 The roadside bushes are Rosa Multiflora or Ramblers Rose, and they grow wild throughout the state. I walked up to one of these bushes and admired the flowers’ tiny white petals and yellow stamens. Then I took a deep sniff. The flowers gave off a lemony scent. But it was very mild — this was not the source of the heavy perfume hanging in the air. I know what a fragrant rose smells like! We have a deep pink specimen of Rosa Rugosa growing in our yard, and these blooms give off a musky aroma with hints of vanilla and a whiff of citrus. Marketed as a type of “wild rose,” the rugosa is native to Japan, Korea, northeastern China, and southeastern Siberia and was introduced into the US in 1845. But the rugosa doesn’t grow wild in New York, and thus it can’t be the source of that early summer smell. You can’t slow down and smell roses like these, unless you happen to be running through a garden. I was determined to locate the source of the sweet smell of early summer. Accordingly, I sauntered around the neighborhood sniffing at various forms of vegetation. 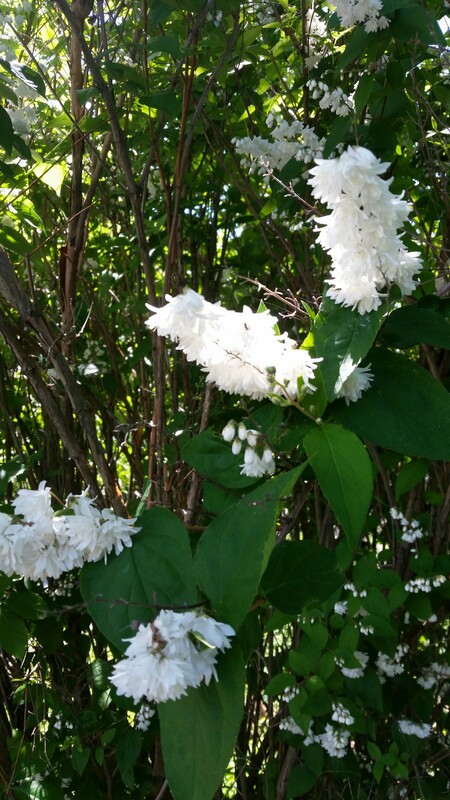 I found a Deutzia bush blooming with clusters of tiny pendant white flowers. When I crushed the petals in my fingers, a faint scent was released reminiscent of grass fields. 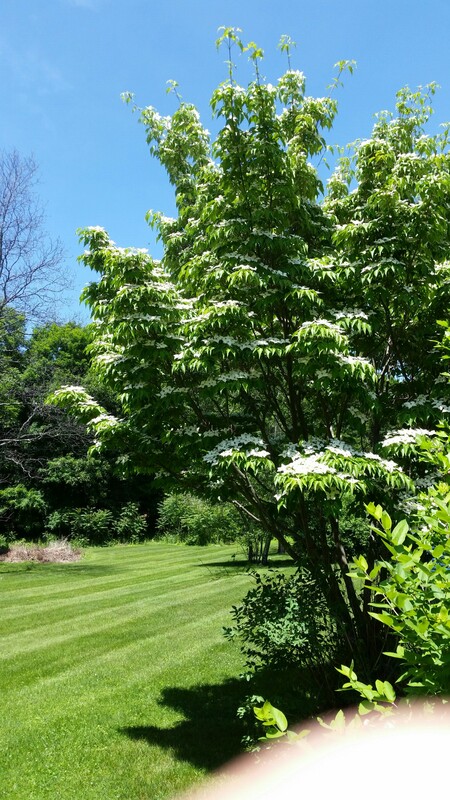 I paused to admire a Dogwood Tree with large showy four-petaled white flowers spread across the foliage. But it didn’t have much of a smell at all. The mystery was finally solved, however, when I discovered the Mock Orange bush. Even as I approached the plant, I was conscious of a cloud of sweet scent reminding me of butterscotch and bringing to mind bright days with dry, cool air, the kind of perfect weather where you take a deep breath and relax because winter is long gone but the heat and humidity of deep summer have not yet arrived. From a distance, the Mock Orange and Rosa Multiflora look quite similar. 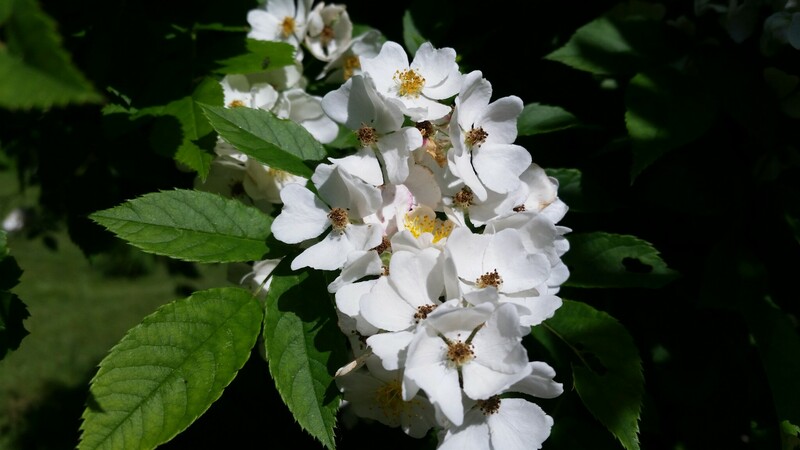 Both plants have flowers with small white petals, but the stamens in the Mock Orange are white, not yellow, its leaves aren’t serrated, and it doesn’t have thorns. As for the Rosa multiflora, I learned that it’s considered an invasive species. 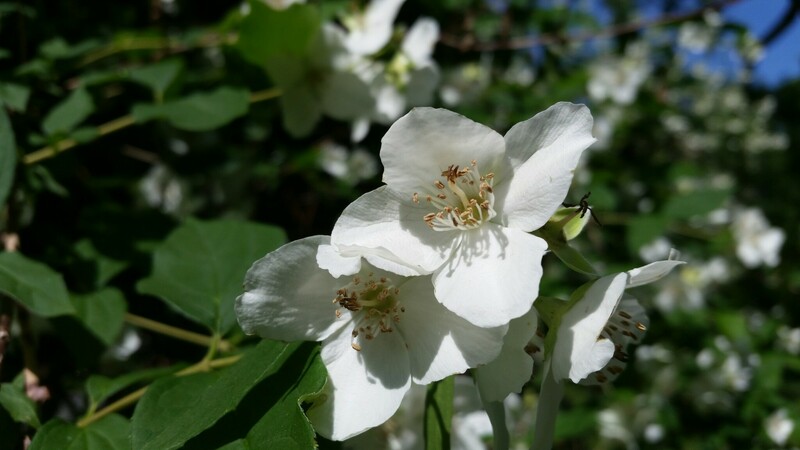 According to the New York Invasive Species Clearing House, the plant, which is native to eastern China, Japan and Korea, was introduced to the U.S. in 1866 as rootstock for grafted ornamental rose cultivars. In the 1930s, the U.S. Soil Conservation Service deployed the multiflora for erosion control and as hedges to confine livestock, and from there the plant moved into open woodlands, forest edges, pastures, fence rows, right-of ways, roadsides, and margins of swamps and marshes. It’s extremely prolific and forms dense thickets that remorselessly crowd out the native flora. 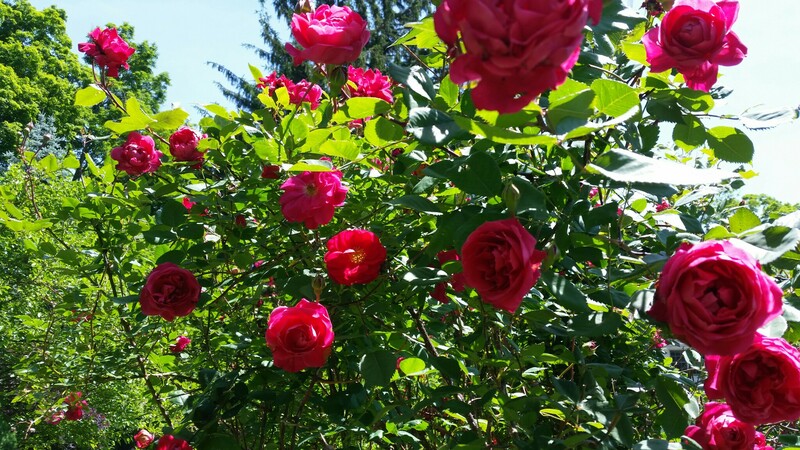 Frequent, repeated cutting or mowing at the rate of three to six times per growing season, for two to four years, has been shown to be effective in achieving high mortality of mulitflora rose. 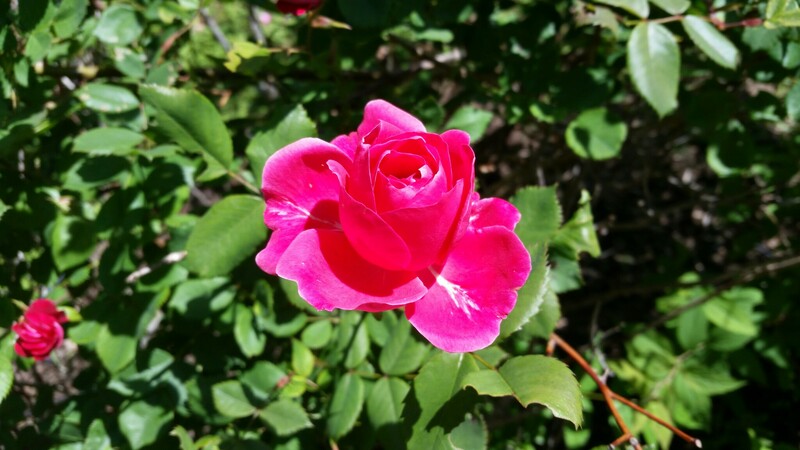 Herbicides have been used successfully in controlling mulitflora rose but, because of long lived stores of seed in the soil, follow up treatments are likely to be necessary. Applications of systemic herbicides, such as glyphosate or triclopyr, to freshly cut stomp or to re growth, may be the most effective method, especially if conducted late in the growing season. Instead of trying to smell the faint scent of wild roses, it would seemingly be more appropriate to pull out a chainsaw and hack away the canes or if you have one, use a flamethrower. And don’t forget to douse the remains with glyphosate and triclopyr. I want you to know that when I argue with people about stopping and smelling roses, I have my reasons.